The full blast of Japanese summer will soon strike, leaving many to contemplate ways to escape the heat. How about a weekend near rivers and mountains? Little-known Komoro, in Nagano Prefecture, may be just the ticket. Located about an hour and a half by train from Tokyo (change from shinkansen to the Shinano Railway at Karuizawa), Komoro offers a laid-back atmosphere but still plenty to see and do. A variety of accommodation options are also available. Historically, Komoro served as a post town on the Hokkoku-kaido (literally "north country road"), a major north-south transportation arterial that carried gold south from Sado Island and carried pilgrims north to Zenkoji temple, some 60 kilometers north of Komoro. In the 16th century, Komoro was fortified by Takeda Shingen and by the 17th century, it boasted a castle overlooking the Chikuma River. Like many Japanese castles, the donjon of Komoro Castle no longer exists, destroyed by lightning strike in 1626. Of course, there's much more to a Japanese castle than just the donjon, and the other castle remnants now form Castle Ruin Park Kaikoen, just a few minutes on foot from Komoro Station. The triangular-shaped park, flanked on two sides by steep natural slopes, preserves many of the castle's original stone perimeter walls as well as the foundation of the donjon, known as tenshudai. 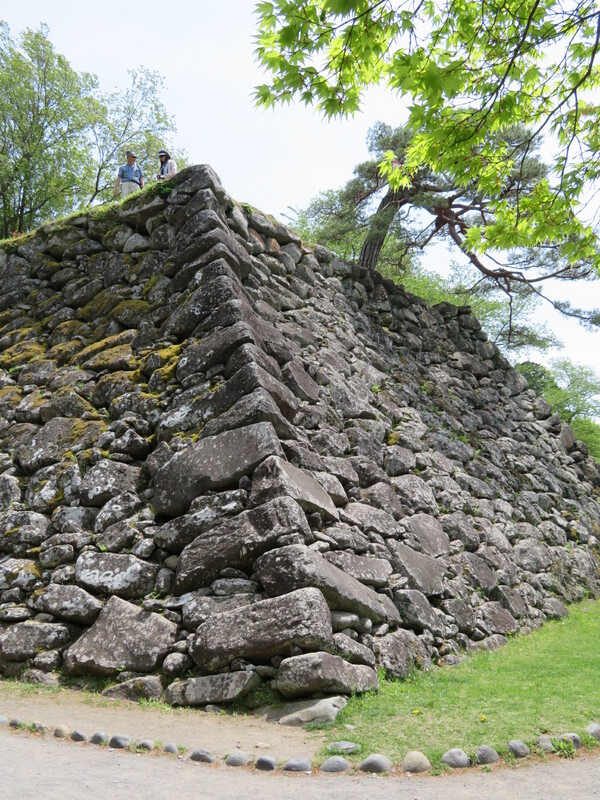 The tenshudai can be ascended for a true appreciation of its high, steep stone walls. A shrine occupies the area that was once the honmaru administrative heart of the castle. 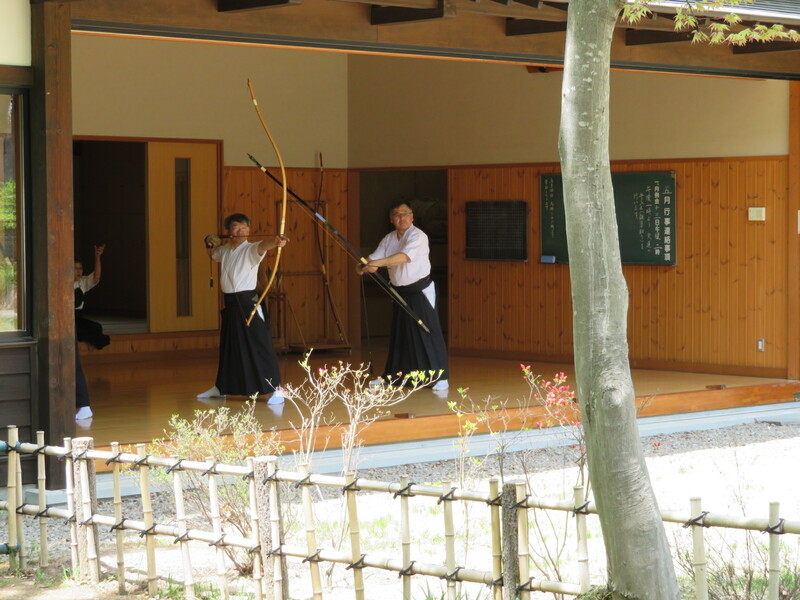 Other features of Kaikoen to particularly look for include the archery range--where traditional Japanese archery is practiced--, the Mizunote viewing platform--affording expansive views over the Chikuma River valley -- the baba horse exercise (race?) course, and the Fujimi viewing platform from which Mt. Fuji may be viewed on a clear day (alas, not in summer). Not far from the Fujimi platform is a suspension bridge leading across a ravine to a small zoo/amusement park. Alas, the animals are kept in cages rather than habitats, so most Western visitors may find it to be a bit of a sad place, better avoided. Entry to Kaikoen is 300 yen (100 yen for children). There is a combination ticket available for 500 yen (200 yen for children) that also provides entry to the four museums in or near Kaikoen. Chokokan is a history museum that sits just inside the Sannomon gate and contains exhibits about the castle's past lords. On the hill above Chokokan, just across from Komoro Station, is the Komoro School Memorial Museum. Inside Kaikoen is Toson Shimazaki Memorial Museum, with exhibits about the Meiji Period writer who can be said to be Komoro's favorite son. On the northern edge of Kaikoen, just beyond the Mizunote viewing platform is the Keizo Koyama Art Museum, featuring the work of Keizo Koyama, another native of Komoro. Two castle gates are extant: the 18th century Sannomon gate, that now guards Kaikoen from the train tracks just beyond, and the recently-restored Otemon gate, on the other side of the tracks. One curious feature of Komoro Castle was that it sat below, rather than above the town, due to its situation on a bluff overlooking the river. Thus the gates also appear to sit higher than the castle. There is a small park (and a parking lot) sitting between the two gates in the area that must have once bustled with military drilling and samurai encampments. The nearby Honjin building that provided accommodation for travelling daimyo now contains a number of historical displays, as does the top floor of the reconstructed Otemon gate. To the east of the Otemon gate is the old part of Komoro, including the Ozuka Sake Brewery and a stretch of the Hokkoku Kaido featuring many traditional storefronts built in the style of the Edo Period. Unless you're in the mood to just meander, though, it's a lot of walking for little sightseeing. Consider instead renting a bicycle from the helpful tourist information center at Komoro Station. They have a range of bicycles available at prices ranging from JPY300 per hour to JPY2,500 per day. Maps and other information is also plentiful here. 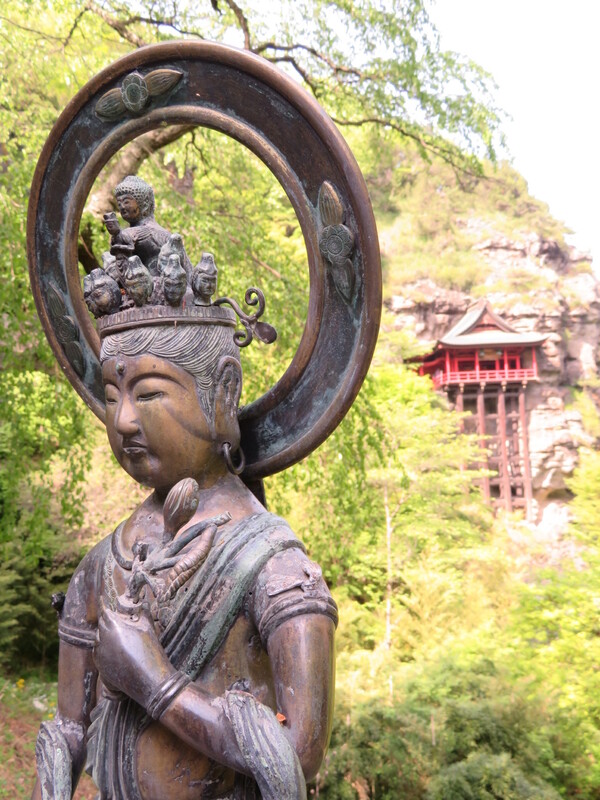 Use a rented bicycle or the local shuttle bus to reach Nunobiki Kannon in the Chikuma River Valley, about 4.5 kilometers west of Komoro Station. Note that the shuttle bus only runs on week-ends and holidays (3 times/day); get details from the tourist information center. Going by bicycle gives you a chance to appreciate the river, Japan's longest (367 kilometers), which rises on Mt Kobushi on the Nagano-Kofu border, flows north through Nagano to Niigata -- where its name changes to the Shinano River -- and then empties in the Sea of Japan. Nunobiki (literally cow leading) Kannon, also known as Shakusonji, is a mountainside temple established in the 8th century. 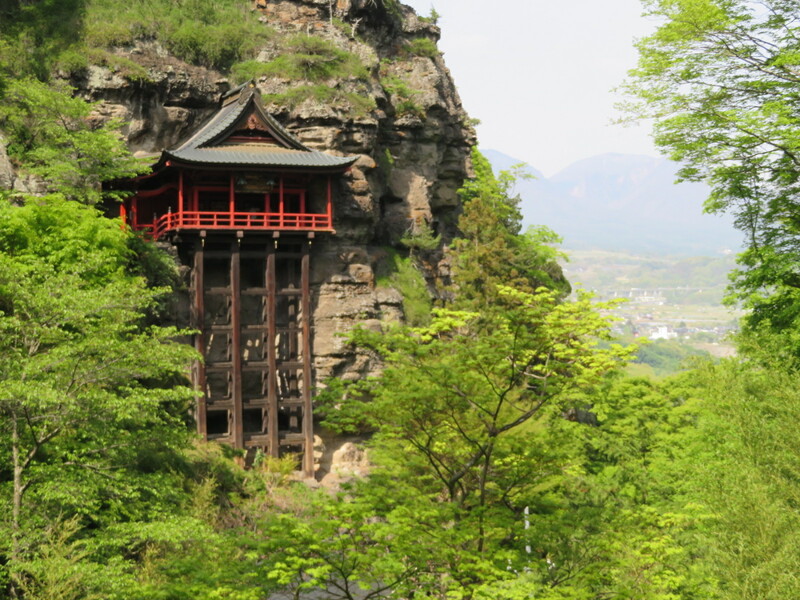 One of the oldest buildings of the temple, built in 1258, is a dramatic sight, sitting atop tall supports and attached to the side of a cliff high above the valley floor below. It is reached by a 15-20 minute climb up a well-established trail through a ravine. The temple derives its name from a popular legend that a cow picked up a piece of cloth belong to a local crone, who chased the cow all the way to Zenkoji temple where the cow turned into a golden Kannon (goddess of mercy). The woman was so awe-struck by this miracle that she arranged for the Kannon to be enshrined at Shakusonji, near her home. Another destination easily reached by rented bicycle is the Manns Winery, about 2.5 kilometers northwest of Komoro Station. The Chikuma River Valley has become known as a wine producing area and locally-produced wines have steadily improved in quality thanks largely to the efforts of Manns Winery, which hybridized European grape varieties to be grown successfully in the ash-heavy soil on the flanks of Mt Asama, a still-active volcano that dominates this area. The winery offers free tours of its facilities daily from 9:00 to 11:30 and 13:00 to 15:30. While they do not provide English tours, they have an explanatory pamphlet available in English to help non-Japanese-speaking visitors follow along. A tasting course of their Solaris label wines is available for purchase in their shop until 16:30. Special summer events in and around Komoro to particularly look for include the Lavender Festival at Dream Harvest Farm, also on the flanks of Mt Asama, about 12 minutes by car from Komoro Station (through July 29) and the Komoro Citizen Festival, featuring 60 mikoshi portable shrines carried through the old part of the town (July 14, 2018 from 13:00 to 21:00).